VICL-69008 / aosis records / Victor Entertainment,Inc. Music for adults by adults. 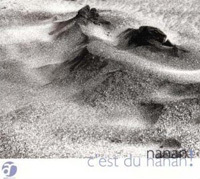 This is aosis records fundamental theme, and a unit that definitely expresses that theme in their music has to be nanan. nanan is a convergence of players with great skill that represent Japan's music scene. Plus they forget that this is work, and say that they do nothing more than play sounds that make them feel good, in a sense this is a very extravagant group. Chuei Yoshikawa (g) who has taken part in recordings and live performances of artists like Eiichi Otaki, Yumi Matsutoya, Masaharu Fukuyama, Toko Furuuchi, Kiroro, Yoshiyuki Osawa and the list keeps going on. Kenji Takamizu(b) who has worked with the likes of Yumi Matsutoya, Seiko Matsuda, Minako Yoshida, Yosui Inoue, Sadao Watanabe, Kazumi Watanabe and many others. Motoya Hamaguchi (perc, fl) who has participated in sessions with artists like Haruomi Hosono, Shigeru Suzuki, Seiko Matsuda, Minako Yoshida, SPEED and ULFULS just to name a few. Junko Yamamoto (vo) formerly of "The Red Birds", who currently does chorus sessions on one hand, and is a successful solo artist on the other. Then last but definitely not least is Hiroshi Shinkawa (key), who has worked on more than a thousand songs as an arranger, these five people make up the core members of this band. All five of these artists have had experiences working with one another in various kinds of sessions, so they understand each other very well. These five were called together by Hiroshi Shinkawa and had the recording done in Hawaii. "We could have done the recording in Hawaii but the feel of this space and the tempo feel is something that can only be brought out in Hawaii. It is laid back and at our own tempo but we were still able to concentrate on recording" is what Motoya Hamaguchi had to say. Definitely, these five master artists let us listen to playing that places so much emphasis on the air around them and is relaxed. They make you really feel that "space" is a part of music, I think it is simple yet very deep music playing. By the way the word "nanan" is an archaic French term which supposedly means "sweet candy." This is a number written in 1967 by Antonio Carlos Jobim, who was a composer that represents the 20th century out of Brazil. The Sergio Mendes style chorus and flute, acoustic guitar and piano melody all make you feel so darn good. This is playing that has all of the charm of nanan condensed into it. This is a classic that won the Academy Award for Best Original Song from the 1950 movie "Captain Carey." Nat King Cole made it a hit when he sang it at the time. The melody with the piano and the acoustic guitar backing create a refined atmosphere. This was a hit song by Hamako Watanabe and Noboru Kirishima in 1948, it is the masterpiece of Ryoichi Hattori, who was a great composer that left a great imprint on the Japanese Pops scene. The clear singing voice of Junko Yamamoto sings through this immortal classic slowly and carefully. Even with the Latin arrangement used on this version, not an iota of beauty was lost from this song, which comes from the excellent sense of nanan's member and the universality of the song itself. This is a number that is now a standard but was composed by jazz pianist great, Erroll Garner in 1954. They have arranged it with a Bossa Nova touch here. The whistled melody and the electric piano sound are very refreshing. This is a Motoya Hamaguchi original. It has been made in a style of music known as the Choro, which is Brazilian. It is played with just the flute, guitar, mandolin, and alto guitar but we would definitely like to have you listen to "space feel" that an ensemble of acoustic instruments can create. This is the big hit song by "The Drifters" that made it to #1 on the American music charts in 1960. This is widely known in Japan through the singing of Fubuki Koshiji. Motoya Hamaguchi's vocals bring out a nice flavor to the song. The tones of the ukulele are also impressive. This is a number that simply has to be called Frank Sinatra's best song, which has been picked up by a number of jazzmen including Oscar Peterson and Keith Jarrett. Give a listen to arrangement that writes a story for you on this one. While it is relaxed, the playing quality is very high as might have been expected of them..
"Don't make such an effort to listen to nanan music" is what they advise. "You could listen and nod off to sleep or read a book or even take a nice long bath. As long as we can help people to relax" this is a display of how much confidence they have in continuing to make even more high quality music all the time. You could listen to it as background music but it is not simply background music, it feels so good and has so much "atmosphere" while maintaining the high quality of the music. I think that is where the attraction to nanan's music lies. Executive Producer Teruo Saegusa for Victor Entertainment, Inc.